Department of Agriculture (DA) Secretary Proceso J. Alcala reiterated the importance of diversifying Filipino’s meal by having less rice and more of other food staples such as adlai (Job’s tears), corn, sweet potato and cassava during the First National Grains Postproduction Summit on November 22-23, 2011 at the Bureau of Soils and Water Management Convention Hall. Sec. 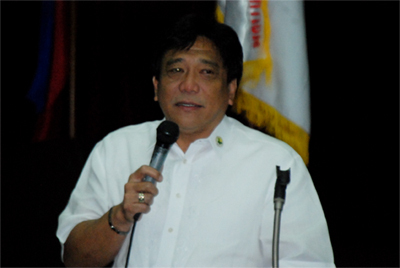 Alcala also said the cooperation of the private sector in the Food Staples Sufficiency Program (FSSP) is important for the project to become successful. Themed “Appropriate Grins Postproduction Technologies: Key to Food Staples Sufficiency” and organized by the Philippine Grains Postproduction Consortium (PGPC) under the National Agricultural and Fishery Council, the summit aimed to facilitate better communication of results and encourage more participation of technology end-users and conduct necessary research on rice postproduction. PGPC was formerly called Philippine Rice Postproduction Consortium which was officially formed in June 1999 and was institutionalized under the DA in 2004 through the Executive Order (EO) 309. In September, 2011, EO 309 was amended through EO 59, and thereby PRPC was changed to PGPC, as endeavor to include other grains in the coverage of the consortium. Other primary institutions associated with the consortium include the National Food Authority, Philippine Center for Postharvest Development and Mechanization, Philippine Rice Research Institute, University of the Philippines-Los Baños, International Rice Research Institute and Corn Development Fund (CORNDEV). Topics discussed during the summit were FSSP of the DA, Status of the DA Corn Program, CORNDEV’s Programs and Projects, DA’s Agricultural Mechanization Roadmap, Status of BSWM’s Irrigation Program, and Impact of Climate Change on Food Self-sufficiency.